Welcome to American Mosaic from VOA Learning English. I’m Caty Weaver. Today on the show we meet a basket artist whose work was recently on display at the Smithsonian Craft Show. A major craft show in Washington, D.C. offers works by more than 120 artists. One artist admitted into the Smithsonian Craft Show also shares her skills with women overseas. Christopher Cruise tells us more. Jackie Abrams is a basket artist from Brattleboro, Vermont. She began in 1975 making traditional pieces for everyday use. But, today she makes modern baskets using non-traditional materials. Baskets from artist Jackie Abrams. ​Ms. Abrams has a series of baskets called “Women Forms.” She says the baskets represent women, their shared stories and layers of experience. She says the inside and outside of the objects tell different stories. Ms. Abrams says the outside shows how a woman is shaped by society and experiences. She says the inside is representative of a woman’s inner strength. Jackie Abrams is one of 123 artists presenting their work at the Smithsonian Craft Show. Artists compete for a place in the show. And judges at the show award the works they think are best. It is widely considered the most important juried craft show in the country. This is Jackie Abrams’ fourth year as a presenter at the Smithsonian Craft Show. But there is another part of her career she considers just as important. In 2005 Ms. Abrams began working with women in Africa. She started sharing her skills and knowledge in Ghana. And that is exactly what Jackie Abrams did. The artist taught Ghanaian women how to crochet using plastic bags they find on the ground. The women made wallets for carrying money and larger bags. The women then sold the goods to help support their families. Jackie Abrams would like to go back to Africa one day to help more women increase their economic power. 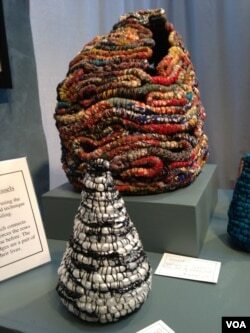 She will also expand her series of basket sculptures and hopes to return to the Smithsonian Craft Show next year. I’m Christopher Cruise. And I’m Caty Weaver. Join us again next week for another American Mosaic from VOA Learning English.